I filed a request back in August for actor Jack Lemmon's FBI file. Yesterday, the FBI finally sent me the entire thing. It's just one page. 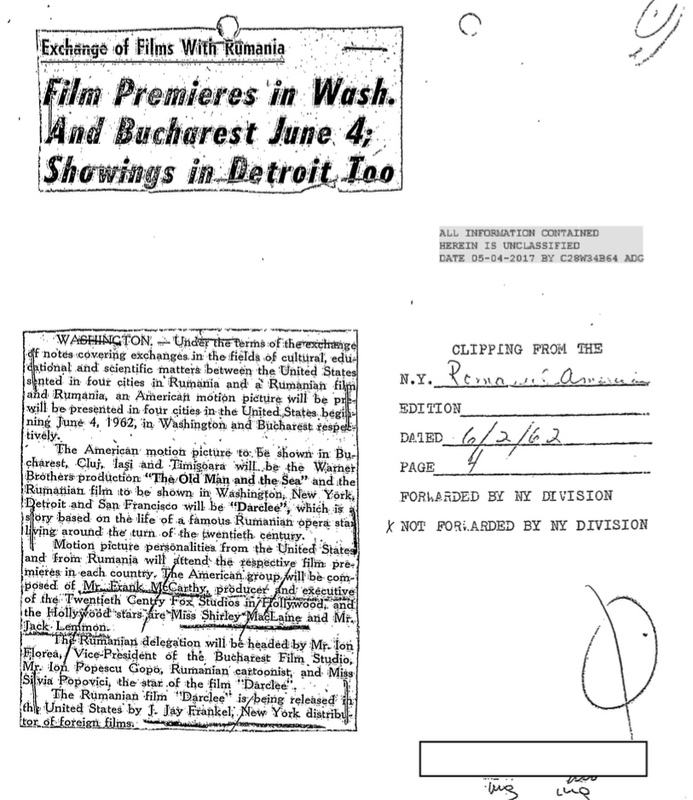 The page contains a newspaper clipping from June 2, 1962 about a cultural exchange between the US and Romania. Lemmon, who's full name was John Uhler Lemmon III, died in 2001. Motion picture personalities from the United States and from Rumania will attend the respective film premieres in each country. The American group will be composed of Mr. Frank McCarthy, producer and executive of the Twentieth Century Fox Studios in Hollywood, and the Hollywood stars are Miss Shirley MacLaine and Mr. Jack Lemmon. This article originally appeared at Paleofuture.com.